Once you've installed the Video SEO plugin, you will have some new video settings under the SEO menu. 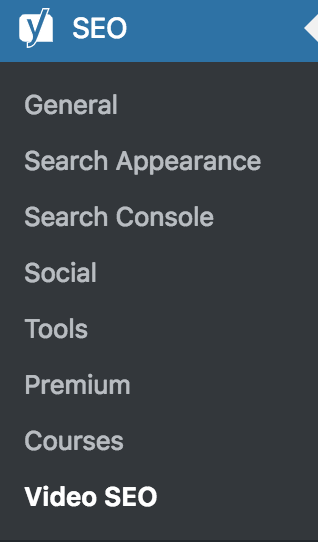 The 'SEO' settings will expand providing you additional options. Click on 'Video SEO'. This section contains the basic settings and allows you to quickly access your video sitemap. This section allows you to enable to Facebook video features as well as making videos responsive where the videos will automatically resize to fit your content width. If you have Vzaar or Wistia, you can set the domain name to use for videos. 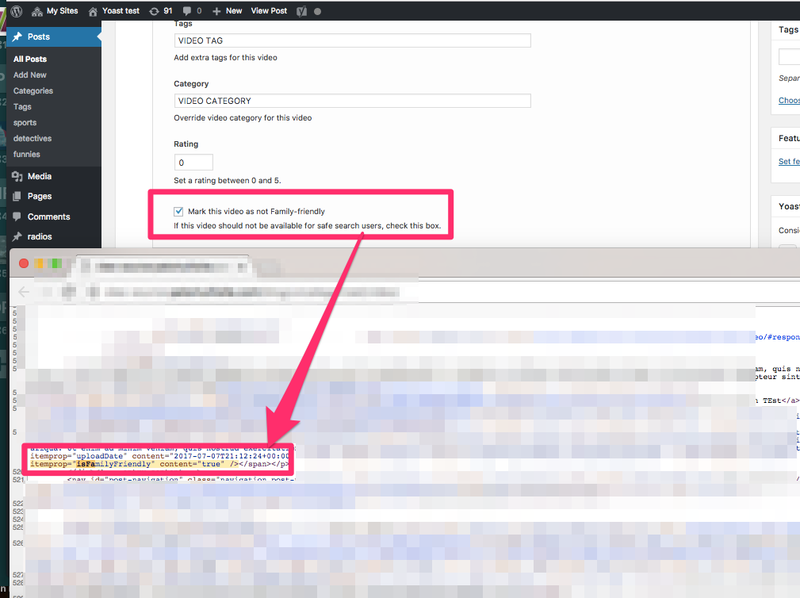 Note: You must enable sitemaps in WordPress SEO before using the Video SEO plugin. Your video sitemap can be located by clicking on the blue XML Video Sitemap Link. 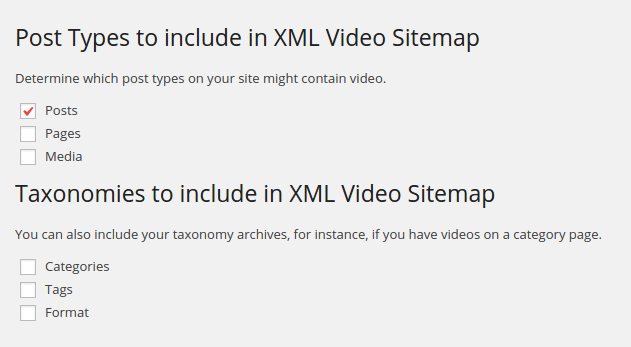 By default Yoast SEO video sitemaps will end with: video-sitemap.xml. This section allows you to customize the plugin so it only scans items that contain videos when building the video sitemap. This does not affect other sitemaps. In some cases, you may need to re-index your videos to update meta data or to check old content for new features. By default, a reindex only scans content that hasn't been indexed. However, if you check 'Force reindex of already indexed videos', you can force the plugin to rescan everything. In this case we've used a Vimeo movie. If we save the draft or publish the post, the video details can be customized under the add-on Video tab. Disable Video: This feature removes the video from the video-sitemap and removes the schema associated with the plugin on the page. The post/page will still appear on the post or page sitemap. Other schema will still be outputted. Video Thumbnail: This feature outputs a video thumbnail which Google will display in a Google Video Search. It appears both as an item property for VideoObject and into the video sitemap. If you do not add a custom thumbnail, by default the plugin will use the still shot of the first frame of the video for the thumbnail. Note 1: You can add a specific video thumbnail by clicking on upload image. You can also add a link to an image that exists on another site. Video Duration: This features allows you to describe how long the video is. It is outputted as an item property for VideoObject schema and also into the video sitemap. If you do not add one, Video SEO will attempt to calculate it. Tags: This feature permits tags to be used to describe the video. It is outputted into the video sitemap. NOTE 1: The default fallback is the focus keyphrase. Meaning, if neither a video specific tag nor a post tag has been entered you may expect the focus keyphrase to be outputted into the tag field in the Video sitemap. NOTE 2: Video SEO will output the focus keyphrase AND ALSO any video specific tags or post tags into the tag field on the Video Sitemap. Category: This feature permits categories to be used to structure the video. It is outputted into the category field on the video sitemap. NOTE 1: Only one category will be outputted. There is no video plugin specific default category fallback. On some WordPress installations "unorganized" may be outputted as the default. Also, post tags or video tags are not outputted in this field. 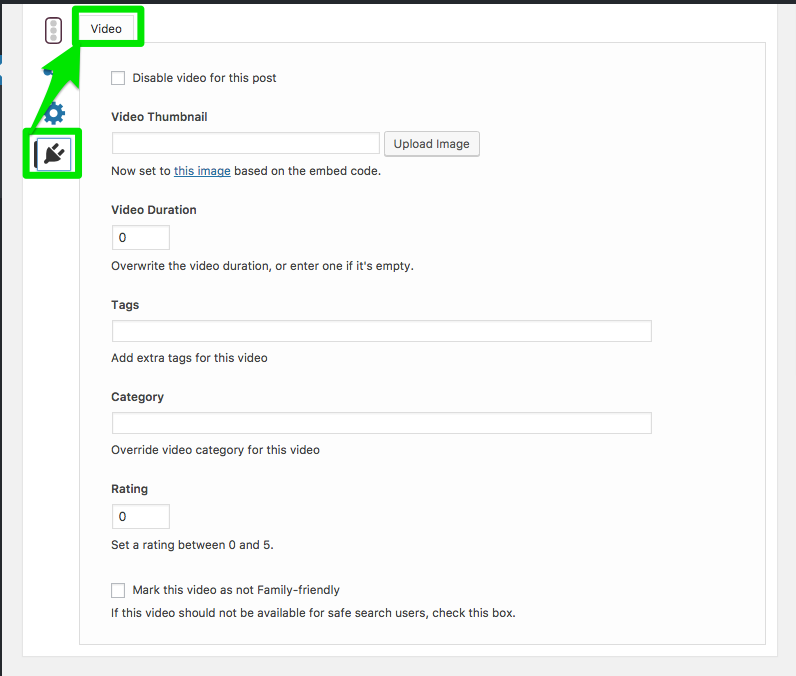 NOTE 2: If a video specific category is added, it will override any post category (including the WordPress default one). Rating: This feature allows a rating to be set for the video. It is outputted into the video sitemap. This field is commonly used in conjunction with a ratings plugin to aggregate user ratings so they may be displayed in search results. Video Description: While not a specific Video SEO feature, the description field on the Video SEO sitemap pulls from the meta description field. If no meta description has been specified, it will pull from the first couple lines of text on the page. 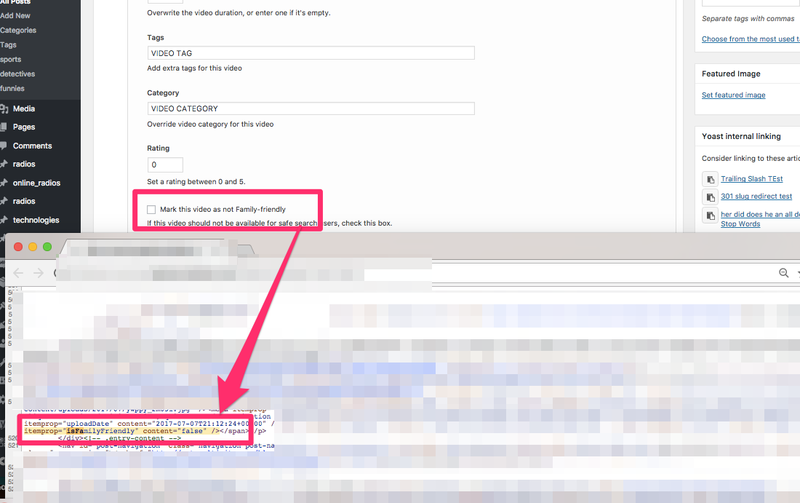 Video Title: While not a specific Video SEO feature, the title field on the Video SEO sitemap pulls from the SEO title. The SEO title is the one created in the Yoast SEO Metabox. This video explains more here. If no SEO title has been specified, it will pull from WordPress title. Mark if not Family Friendly: This feature when selected means the video will not be shown if using a Google Safe Search. It is outputted as an item property for VideoObject schema and also into the sitemap. The default is for the box not to be marked. NOTE 1:Please know that if you do not mark the box the schema that gets outputted will be "false". If you do mark the box the schema that gets outputted will be "true". If you want your videos to be seen everywhere in a Google Video Search then leave the box unmarked. That's really all there is to it, just embedding a video will make all this work. If you write a meta description for your post, that meta description will also be used for the video XML sitemap, and any tags or categories you assign to the post will also be used in the XML Video sitemap. If you want to look under the hood, you can do a view source of the video post. You'll see that the plugin has changed the OpenGraph type to "video" and added a couple of other meta tags to indicate to both Google and Facebook that this is a video page. If the video tab does not appear, the plugin has not detected a video. Please make sure you are using a supported video hosting platform and/or a supported video embed plugin. If you use custom fields, see this article. If you use a visual page builder, see this article. If you have a custom post type called 'Video', see this article. That's it! 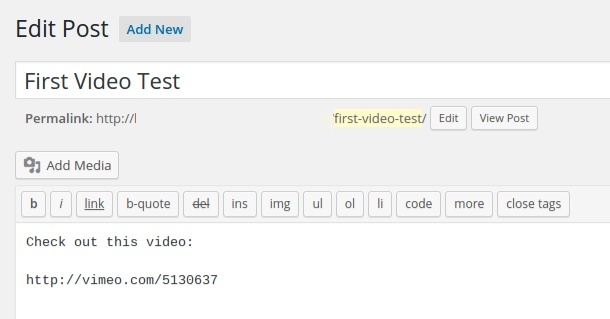 Have fun using the Video SEO plugin!